Let’s get some background on Altama: Since 1969, Altama has been the leading manufacturer of military and combat boots for the US Department of Defense and it all started in Vietnam with their infamous Jungle Boots. It was founded in Darien, Georgia. 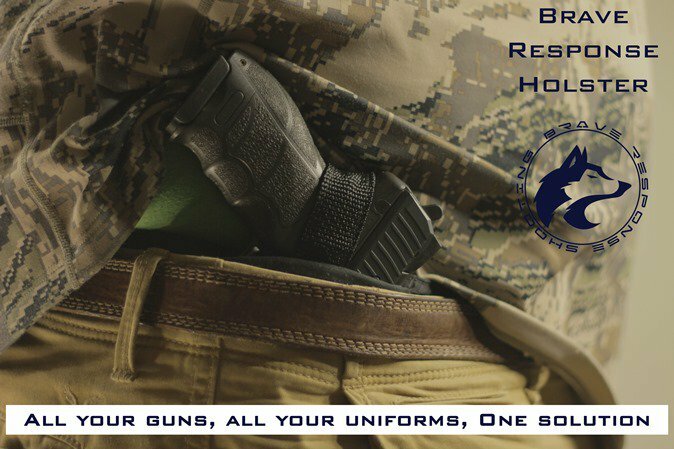 Altama markets and distributes footwear to federal, state and local agencies, military schools, police, Special Forces, uniform shops and Army/Navy retailers. Altama boots offer a variety of features including Gore-Tex linings, Side Zippers, slip resistant outsoles, safety toes, puncture resistance, and boots made in the US that are Berry Compliant. 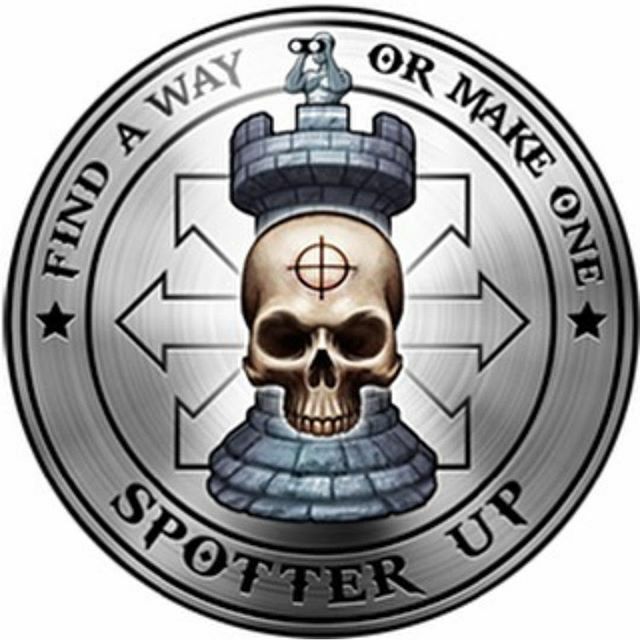 The designer worked with the US SOF community on the development of the Altama OTB Maritime Assault. Okay. 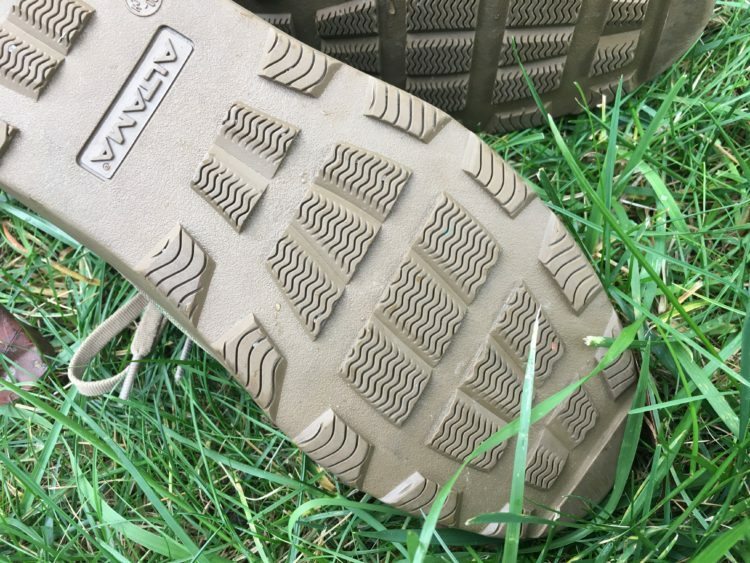 Let’s get into reviewing the Altama – Over the Beach (OTB) Maritime Assault Mid Boots because I’ve had them for more than a minute now. 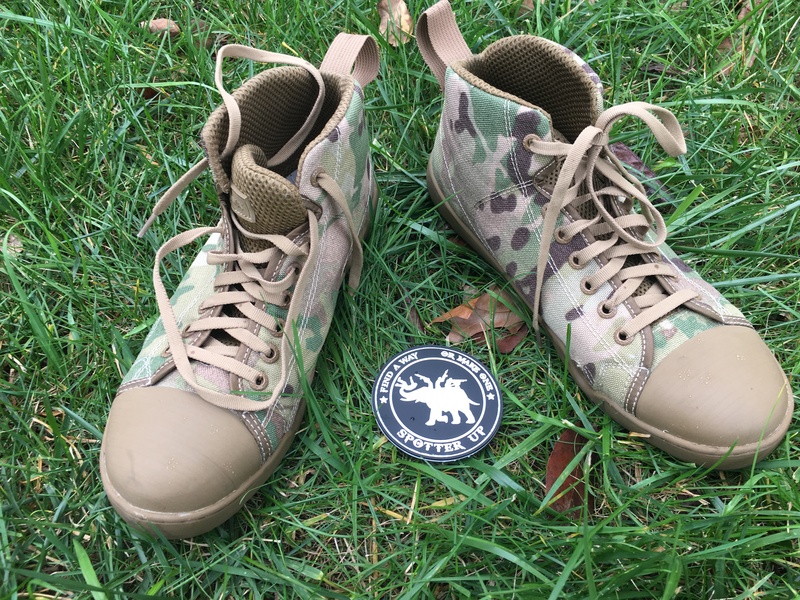 In fact I purchased the Altama boots in late August after attending Warrior Expo East and seeing them at the Tactical Distributors booth. So how do they ride? 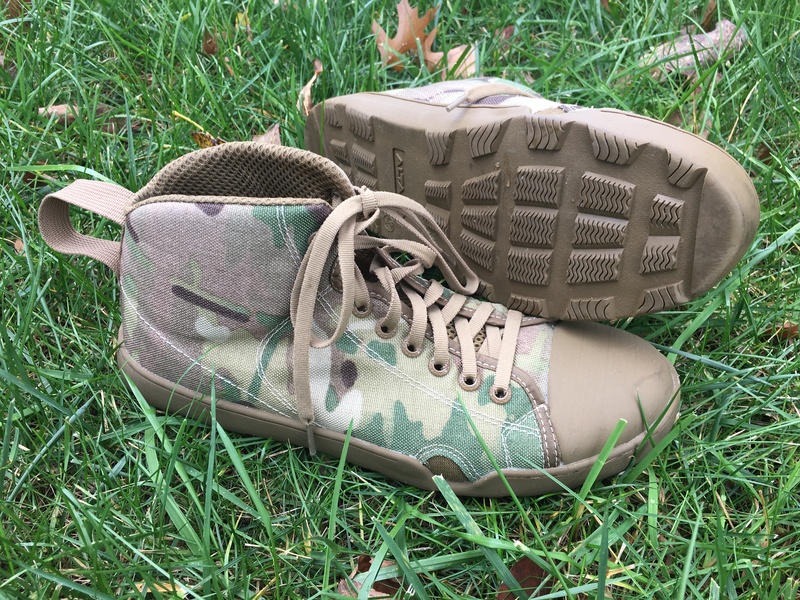 What you’re getting from the Altama is a really light, and slightly cushioned shoe that helps you remain fast and agile on your feet more so than a tactical boot. Not bad for street wear, short hikes, the gym and CQB training. Generally speaking, the shoes are useful both as gym training shoes and for short racing, but these are not to replace distance running shoes. 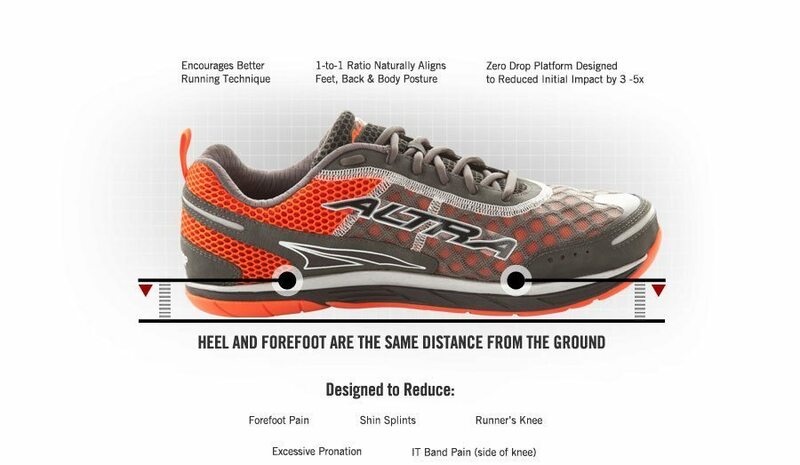 They are very similar to the Altras line of shoes with their Zero Drop but lack that cushy Altras outsole and therefore lack the torsional ability of the Altras outsoles to twist when your feet twist. The outsole makes up the base of the running shoe or boot. The outsole is the durable part of the footwear that makes contact with the ground, providing traction. There are some work-arounds for that which I’ll explain further into my article and I’m going to repeat much of the info I shared in previous shoe articles. One of the things I like about the Altra Zero Drop outsole is that I can use them when I’m doing certain Crossfit movements and Olympic movements. The flat surface of their shoes allows me to squat or do push jerks in the gym, and then run out to the street for distance runs when I’m done with a gym circuit. I can lift weights, box jump or run hill repeats along the trails by my house and cycle through without problems. First off let’s just state that the OTB Boots are comfortable. If you’ve ever worn a pair of Converse or Chuck’s and enjoyed the feel then you’ll definitely like the OTB Boots because of the added features. The company created the boot for use in all tactical water operations with a fin friendly fit. 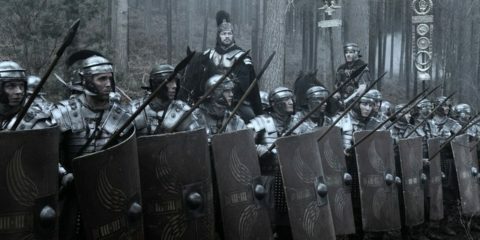 For those who are rule breakers or allowed to wear non-traditinal footwear while in uniform the OTBs are cool. Altama offers 60 Day Comfort Guarantee and a 1 year Manufacturer Warranty and retail for about $90.00. They also offer a low-cut shoe. The boots are reminiscent of the Chuck Taylor’s from the Converse Rubber Shoe Company created by Marquis Mills Converse in 1908. Chuck Taylor was an American basketball player who joined a basketball team sponsored by the Converse Company called The Converse All Stars, hence the name and brand of shoe familiar to many of us. A variety of professional basketball players soon wore All Stars. The shoes were soon worn by many aspiring basketball players and during World War II American soldiers began to wear All Stars while in training. The boots use an outsole with mildly aggressive lugs/studs unlike the flat tread found on your typical Converse or Chuck’s. Most runners, particularly those with foot issues, should not purchase these with the intent of running distances because the foam is less cushy than most running shoes found on the market. 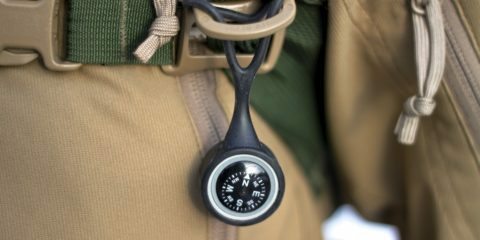 They will work but it depends on many factors: what shape your feet are in, what kind of workout you intend to do, and what kind of terrain, and lastly duration. However you can work on strengthening your feet in order to use lower profile shoes or boots that use a flat outsole. I like to think of the OTB boot as a pair that bridges the gap between a trail running-shoe which has a stiffer outsole than a running-shoe and a boot that has a more rigid outsole than the latter two. The lugs use a wavy pattern good to go on most wet surfaces. You actually want a stiffer boot outsole than a softer boot or shoe outsole for long day use because your feet will get less tired. 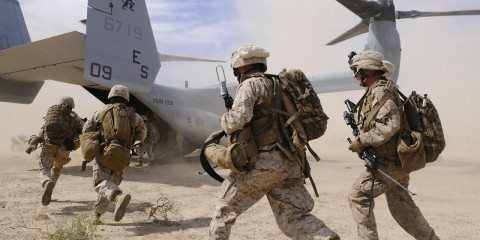 Use the OTB for shorter missions than for something like long-rucking events; do your job quickly, get the bad guy and go home. 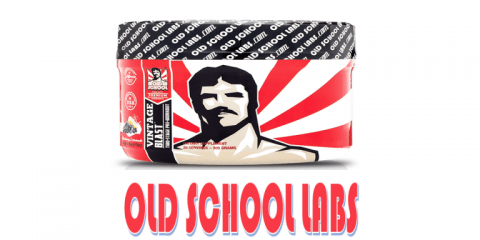 Start using them on short, easy workouts at first, and then work your way up to harder workouts. If the shoes feel good on your feet I recommend rotating between your old shoes and your new Altamas weekly for about a month. This will give you transition time to adjust and build up. In fact, your posture will change too in the Altamas because you’re going from the traditional 2 to 1 ratio of a wedge-shaped heel to toe shoe into the newer flat 1 to 1 ratio sole of the Altama. Your heel and forefoot are the same distance from the ground and this induces proper form to reduce initial impact by 3–5 times. Try this schedule to allow your muscles and tendons the necessary time to adapt back to their natural state. 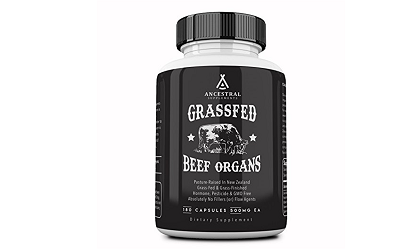 Your body will be taxed a bit differently. Embracing the lighter, more flexible shoe means your connective tissue and muscles must strengthen and stretch differently. Good posture comes into play here and you’re going to get the natural Achilles loading for better propulsion. Most shoes and boots come with an insert, called a sockliner or insole, that have a bit of padding right where the arch of the foot rises and ends in order to give the foot adequate support. The sockliner is the first layer of soft foam which your foot rests on inside the running shoe or boot. I have flat feet and I prefer shoes that don’t have an insole with an arch. I don’t like to feel any pressure on my arches and I prefer the inserts to be thin. I actually removed the OTB boot inserts and used my own cheap 1 mm thick, Walmart brand inserts. I run in a lot of different brands of shoes, and try out new stuff all the time, and know what will work for me. Build your feet up smartly and work those muscles. The OTB uses an insert with a bit of a pronounced heel-cup to surround your heel and a bit of a rise on the arch too. Active people who spend years running in traditionally cushioned shoes and boots are going to need time to adapt their feet and calves to the new stresses of the flatter OTB because of the leaner, stiffer more minimalist outsole. Running in a minimal shoe means you’re giving up some of the heavy, cushioned, motion control of typical shoes. For those who have a lot of pronation it might be good to get a video assessment and a test run in them to see if you’re in good knee and ankle alignment. A 1-to-1 ratio shoe naturally aligns the feet, back and body posture and encourages better running technique. Can you walk with these shoes after taking them straight out of the box? Sure, go for it. Wearing them around the city, they pretty much feel like a normal sneaker, and are pretty dope. The look good paired with jeans or Chinos. One other work around is to purchase the Altama Maritime Boot and not the shoe. The shoe has little ankle support and the OTB boot with the higher heel collar will help counter some of the heel rotation some may find when running in the OTB shoe. The heel collar (sometimes called heel cuff) forms the top of the shoe, supporting the heel and Achilles tendon. The collar prevents the foot from slipping inside the shoe and makes it more stable to run in. When purchasing a shoe ensure the collar does not irritate your ankle by first testing out a pair of the shoes and boots. 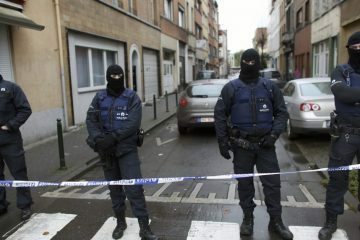 The boot and shoes also use a stiff heel stabilizer. It is an internal support feature in the rear of the shoe or boot that conforms to the shape of your heel. The heel stabilizer/counter is the internal plastic structure of the shoe or boot which wraps around the heel of your foot. It holds the heel in position during the movements of running. The foot pattern parts of the boot that surrounds the heel should have a stiff reinforcement sufficient enough to endure hard use. Medial posts are made from EVA, that is denser material than the midsole of most running shoes. 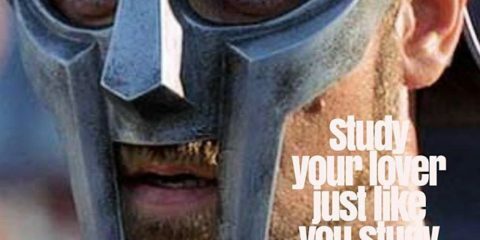 It also helps you with stability. The midsole is a layer of spongy material between the outsole and the upper. These cushioning materials combine bounce and durability. The material (usually EVA or Polyurethane foam) that sits below the upper and above the outsole, providing protection from impact forces and oftentimes encasing nonfoam technologies, such as GEL or Air, to increase durability and protection. These shoes don’t have that so I mention it here as they help with over-pronation. If you’re going to run on snow or uphill in mud you’re going to need a more substantial shoe that has deeper lugs for better traction and these are not them. 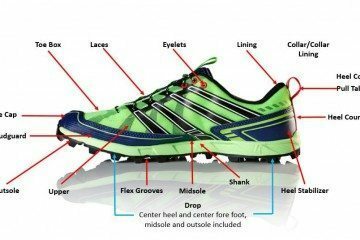 You also need a shoe or boot with a more robust or tougher foot plate, that can twist with your feet, if you intend to run distance on trails. 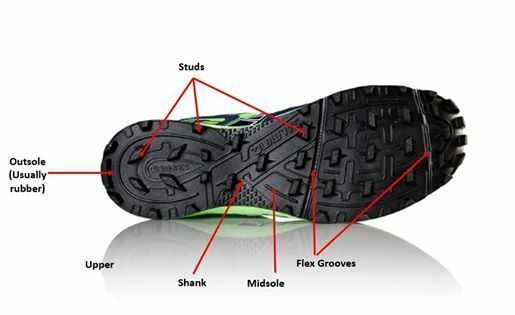 Channels on the outsole called flex-grooves help the shoe flex along with the natural movement of the foot. The combination of pods, studs and features such as the flex grooves can determine how responsive a shoe is during your activities. Again, this is a short distance shoe, that can be used to train in the gym or for short walk outs. 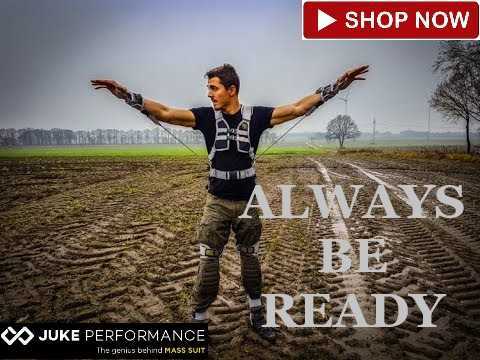 It is meant for forward propulsion and not meant for aggressive, prolonged lateral movements when doing something like kickboxing or football double-foot agility side shuffle drills. 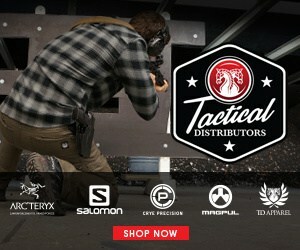 Yes, they can be used for pivoting movements done in CQB training. Keep it simple. The air mesh, foam tongue and collar are semi-soft on the ankle and anterior part of your foot. The tongue is a soft elongated flap that fits over the top of the foot to protect the tendons and blood vessels from pressure caused by the laces. The tongue is a separate strip on the upper and it is adequate for the job. The tongue also prevents the laces from rubbing against the instep of your foot. The Cordura 1000d quarter panels are durable, and pliable but not thin or flimsy, and they will give you the ankle support the OTB shoes will not. 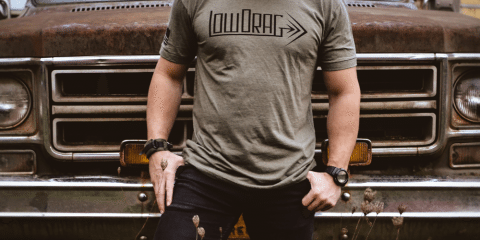 The Codura 1000d material are high abrasion and the OTB comes in both solid colors and MultiCam. 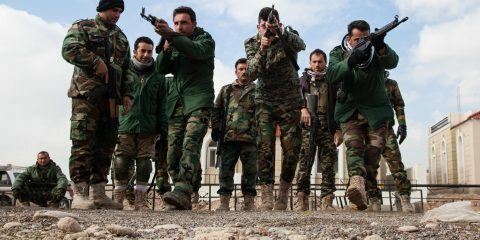 The Multicam are smart-looking. I get lots of stares and some questions about where I got the footwear. 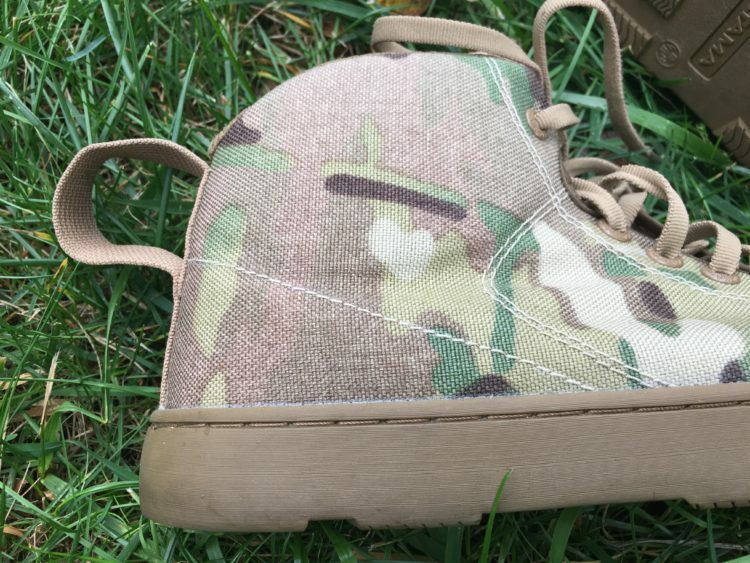 They are different looking than what is currently on the market for military or law enforcement footwear. They use air mesh linings that help wick away sweat and other moisture quickly from your feet. 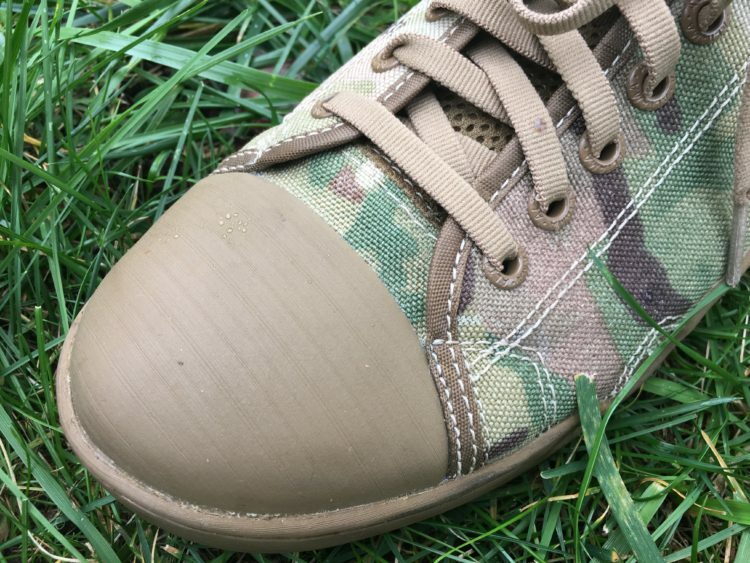 Non-shine rust-proof lace hardware will not break on the battle field. I have no idea if this is true but appreciate the use of rust-proof hardware. The eyelets of a running shoe should be large enough and smooth enough so you can easily and quickly adjust your laces. These are good. The fabric pull tab on the heel of the boot will help to keep the fin from shifting a bit much. The tab is excellent for putting the fin on in the dark or grabbing the shoe on or off your feet while submerged in water. If you don’t like the pull tabs just cut them off and melt the fabric with a lighter. The low profile laces are a smart feature too. Altama states the full length one piece ABS shank provides stability and support when climbing a caving ladder. 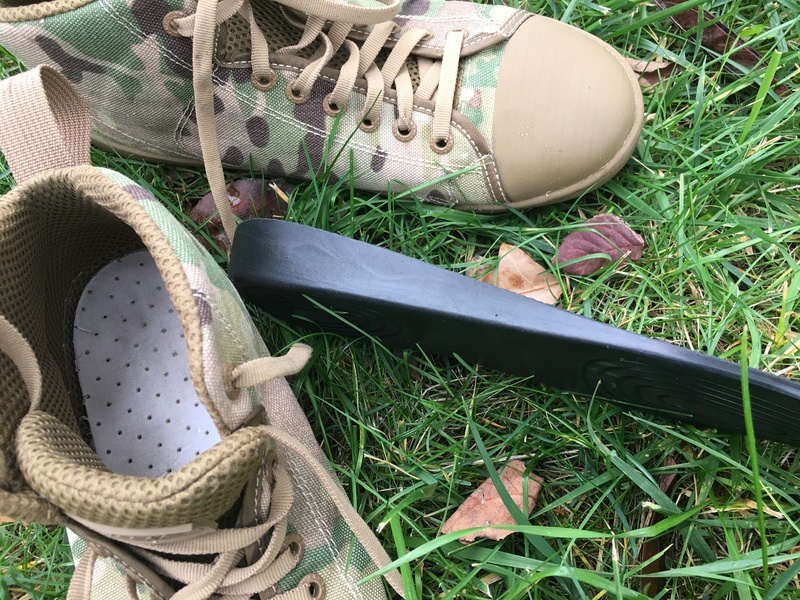 The purpose of a shank is to stiffen the boot under the arch, which makes the middle portion of the shoe firmer (minimalist shoes don’t have it). 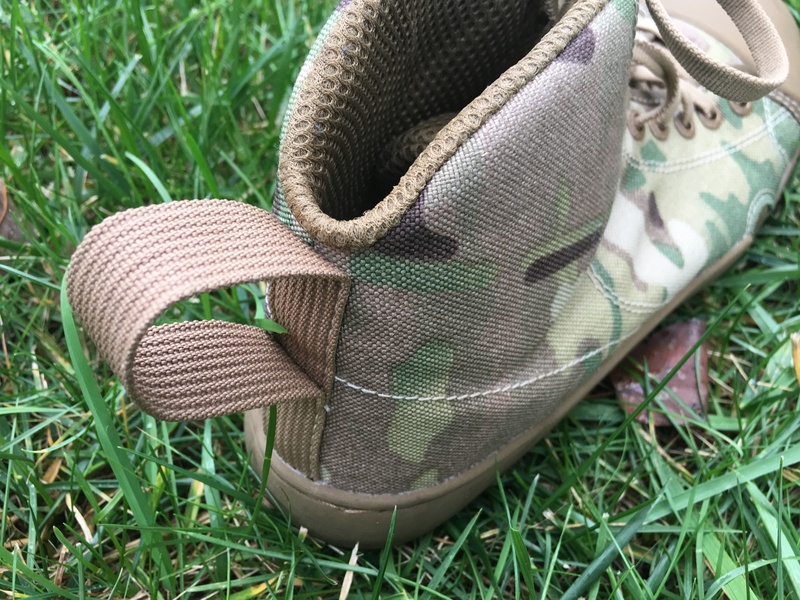 Some companies wrap the shank up to the medial post part of the shoe or boot to add more stability and thus allowing it to function more like a medial post. The shoes are good for climbing but not great. You can use them to climb up beginner-intermediate routes but don’t expect to scale like Rogers Rangers on cliff walls in Normandy. Ultron® PU contoured insole will not absorb water. 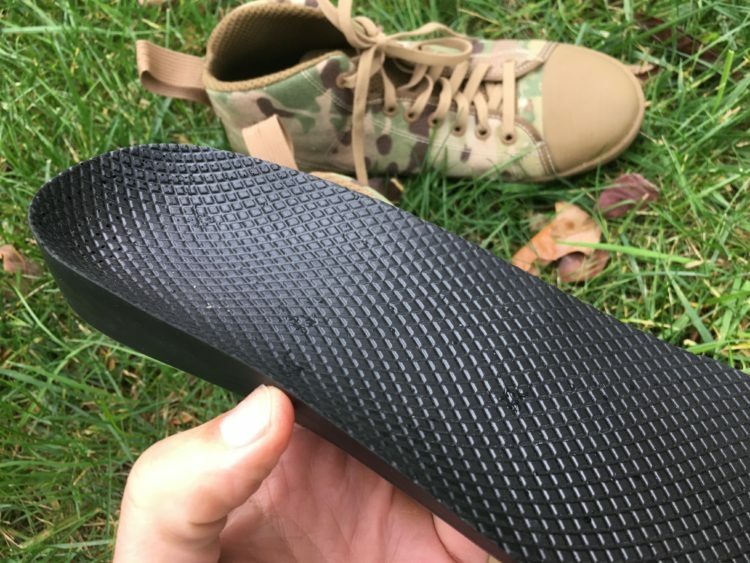 The boot insert has a nice heel cup that holds your heel in place and prevents it from shifting within the shoe. The insert is soft but consider using your own brand of insert for added comfort. Front non-metallic drain ports allow for water to drain easily when flexing the boot. These aren’t going to drain as quickly as the LALO brand of footwear. The LALO brand uses large drainage ports on the outsoles. The OTB will drain quicker than boots with traditional drainage ports. In fact they drained quicker than I though they would. They company put the drain ports right where the foot flexes and the flexion pushes the water right out of the ports. SEAL Rubber sticky outsoles. 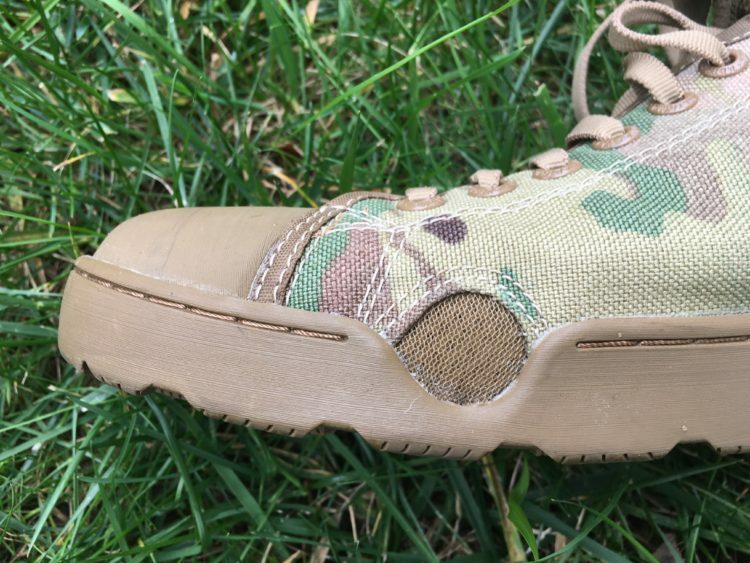 Altama states in their literature the rubber compound was originally developed for rock climbing shoes and modified for wet tactical operations. SEAL Rubber is one of the stickiest, high traction rubbers on the market today. I found them to be good an all surfaces I stepped or ran on but I have yet to use them in oily or snowy conditions. The shoe has a half circle toe cap and it is more durable than a Chuck’s toe cap of course. 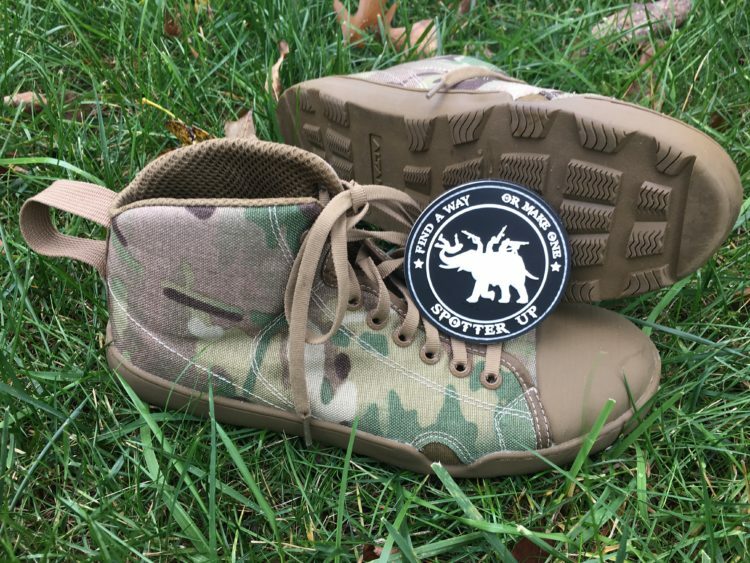 The throat of the boot opens up widely so you can shove your big foot into the boot quickly. The stitching on the boot uses two lines of stitching to provide the shoe the best construction. Reinforcing stitching at key stress points over the boot and the quarter panel help give the boot structure. The quarter panel is the main pattern part on the side of the boot pattern. The Nike Swoosh, New Balance N are all located on the quarter panel. 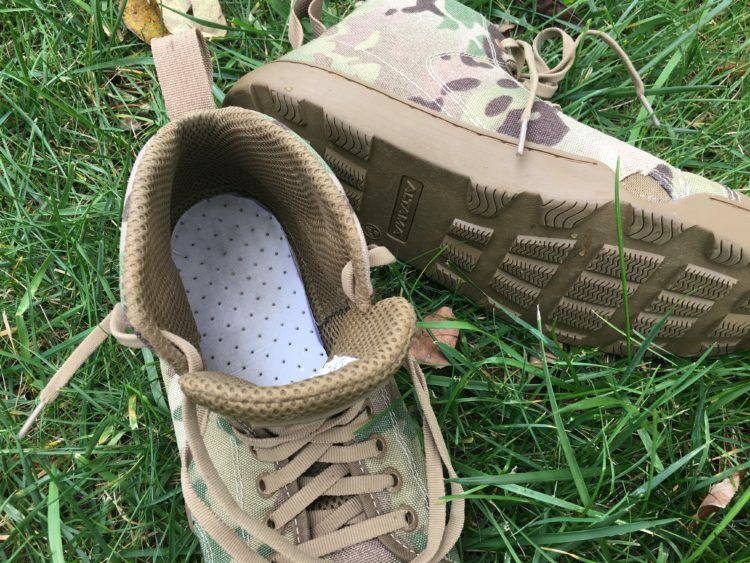 The Cordura construction is more abrasion resistant than canvas and this is a well-priced and versatile “tactical” shoe. Go out and get a pair. Cons: The boot does not come in wider sizes such as 2EE or 4EE. The shoes fit on the smaller side so I recommend going up one size especially if you intend to wear thick socks. If you’re a 10 1/4 I recommend going up to an 11 or 11.5. It would be nice to see a wider shoe offered. 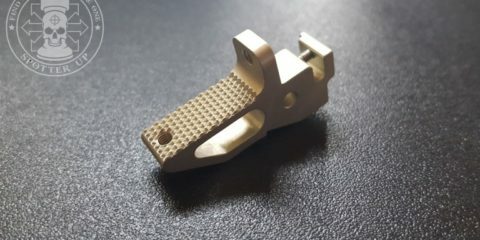 Altama wrote to us and stated they will offer wider sizes soon.